From Cosmic Dust to Strip Mall, the use of matter in some parts of the universe has taken on the self-organized palor of unrestrained comerce, a commerce that inherits nothing from the galactic economy but to consume for the sake of consumption -- a neurotic need to make more because less in not an option. 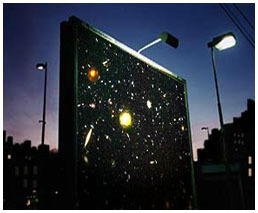 Cosmic Signs are a small step to bring back the night, celebrate all this sensless beauty without giving up any bargins . Scari Development will keep you in touch with your cosmic origins through Celestial Bulletin updates. If there are cosmic happenings of interest, we will update you no mattter where you shop, no matter how distracted you get by the next new product, your values can remain grounded in your personal survival strategy (enhancing your kit) while retaining a cosmic place in the universe. 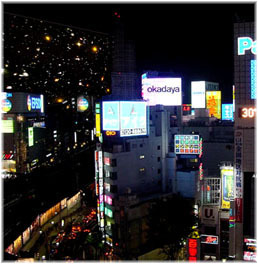 Cosmic Signs, cropping up all over the world. Newly installed Celestial Sign on San Pablo Ave. in Phoenix, Arizona. 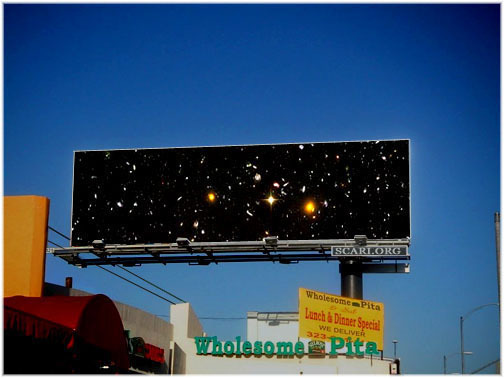 Los Angeles will receive thirty Cosmic Bulletin Signages in the months to come. Remember, you are one with the universe.